Never before have I ever been so terrified for a complete stranger. He was no ordinary stranger though, he was a child. We were gathering at an outlook on Machu Picchu, situated atop a mountain at an altitude of almost 8,000 feet, looking out over a gorge hundreds if not a thousand feet below and there was NO GUARDRAIL! As the child stood at the ledge, tourists continued to pile on to the stone platform likely used as a guard post for its Incan inhabitants over 500 hundred years ago. I saw the boy’s path back to safety blocked. A wall of people crowded him closer and closer to the edge. He stood eye level with every traveler’s backpack, a new danger as I anticipated one absent-minded turn could sweep him off the landing and plummeting to his death. He stood there looking down at a distance his little mind could never fathom. The wide river below looked like a tiny ribbon unraveled on the floor of the ravine. At this height, we could hardly make out the small homes dotting the mountainside of the surrounding Andes Mountains. The view was absolutely stunning. And so was the danger that this child found himself in! That child could be YOU. That child could be ME. In life, we often stand at the precipice of great danger and there stands nothing between us and a disastrous fall. NOTHING. No guide standing post, no warning signs posted, no fence, not even a guardrail. 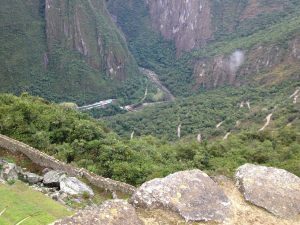 That was one of many heart-stopping moments in my visit to Machu Picchu years ago. Our buses traveled fast and furious through the switchbacks on the single-lane dirt road as we climbed, climbed, climbed up the mountain to one of the 7 wonders of the modern world. And still there were NO guardrails!! “How could they not at least have guardrails?” our group pondered. We often find ourselves standing at a precipice, enjoying the most amazing view but not recognizing the danger around us. That’s why we need guardrails. That’s why we need WISDOM! Wisdom protects. Wisdom guards. Wisdom saves us from consequences and missteps that we would never have imagined. But it is not from you. And it doesn’t come from me. HE is the one who holds our victory. HE is the shield for those whose walk is blameless, HE guards the course of the just and protects the way of His faithful ones! Wouldn’t it be great if we didn’t have to worry about that ledge? If we could stand there securely enjoying our surroundings, wondering at the beauty and splendor of life and not worry about unforeseen danger? We could speed up the mountain with each twist and turn, going up and then back down, without fear of disaster? Thankfully that small boy did NOT fall on that day. Thankfully no careless turns or crowding of that landing forced him over the edge. As I began to quietly and calmly draw attention to his position, he gradually weaved his way back to his oblivious parent’s side. And I breathed a DEEP sigh of relief. I could not stand by and watch someone in imminent danger without speaking up. Without taking action. Without warning of the danger in taking just ONE. MORE. STEP! And I won’t stand by now either. I will continue to share with you God’s words on wisdom…His purpose for our lives and relationships… and His guidance through the dangers and complexities we face. We will use His wisdom as our guardrails. And we can trust in the safety and security that His wisdom provides! 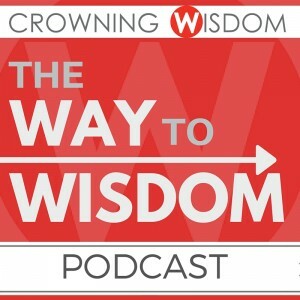 I invite you to join me here at Crowning Wisdom if you are not already a subscriber. And please share this with others! As culture and society continues to change over time, we need to know how to apply God’s unchanging wisdom to a changing world. This is my mission with Crowning Wisdom! Please join me along this journey and share this with your friends- help them find the guardrails necessary to bring direction, protection, and success along their way!